The other day, I was pulled away from my workbenches by a request from one of the print collectors to visit his school. 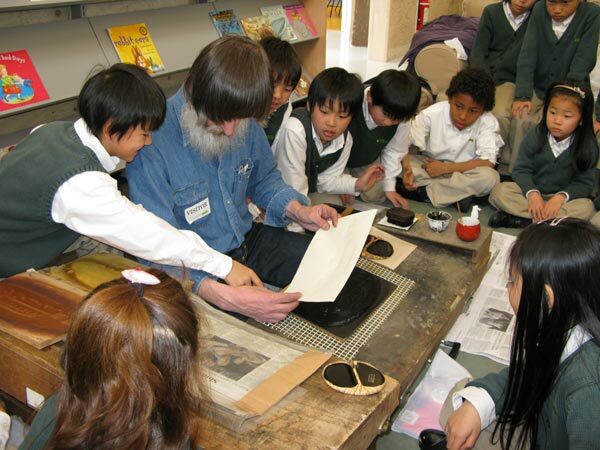 He is the librarian at an international school here, and as part of a 'book week' he was organizing, he thought it might be interesting for the kids to see how woodblock prints are made, given that this was the method used to publish all books here in Japan through most of the Edo period. Now I'm pretty busy these days, but it seemed like a good chance for a nice break from the work, so I accepted the request, and spent most of a day over there (the school is in Chiba). He gave me a spot in one corner of the open-plan library where I could set up my printing kit, and over the course of the day, groups of kids were trooped in every half-hour or so for their turn to watch the show. And it was a good show! When you have a whole class of kids for such a short time, there is usually no time for any kind of 'hands on' activity; each child would only have a few seconds available for his 'turn'. But I really want to run a presentation that will draw them in, and - hopefully - be not only interesting to watch as it happens, but will be something that they will remember for quite some time. I want to plant some seeds! They all sit on the floor around my printing bench, coming in right up close. I have prepared a printing 'set' - three blocks, with a matching pigment bowl and brush for each one. Moistened printing paper is at hand under a clear plastic cover, my paste cup is on the bench, and a strong baren is ready on its pad. I start talking the moment their bottoms hit the carpet. As I prepare the first block for printing by getting it properly moistened, I explain to them that they are about to see a woodblock print being made ... twice. I'm going to do it the first time, but for the second one ... And I leave it hanging in the air. I start printing, laying out the steps as I do: "Here we go. First step is to stir the pigment in the bowl, wipe some off, then a stroke onto the wood. Got it? Stir ... wipe ... stroke." I push them to repeat it with me, and as I move through the steps of pigment application, brushing, pulling the paper from the bag, placing it, rubbing, etc. and etc. they soon end up chanting the steps along with me. With the first colour done, I announce that we're now going to move on to the next colour, and I call them to get things ready for me. A kid sitting at my right gets to switch the two blocks, the group at my left changes the pigment bowl and the brush, another kid learns that he is to open and close the plastic bag as I need to access the paper. I start the second colour, but get a bit 'confused' and begin to make mistakes - starting to brush before putting pigment on. But by now, the kids are getting the idea, and begin to yell out corrections. The buzz builds and they become totally involved with the process, watching my every motion with intense interest. A couple of minutes later, we've worked our way through the three colours, and I pull a finished print off the last block ... to wild applause. And then? "OK gang; I'm leaving. You know what to do ... Come and get me in the hallway when you're done ..."
And I do leave. A few minutes later, somebody comes to get me, and I return to see their finished print. And quite often it matches my sample really quite closely. Their very first print! And made without any direct supervision. That's the end of their session, but I tell you, they have to be literally dragged away to head to their next class. We talk about kids being 'sponges' and you know it really is true. Make it interesting; make it challenging; and make it self-directed. You'll never tear them away. That is fantastic! And a lesson method that many artisans could use in similar situations I think. Thanks again Dave for the visit and a great description of the whole event. You really inspired them and I hope those seeds produce some trees & fruit. Cheers!